Spider-Geddon #3 Review: Upping the ante – AiPT! Christos Gage seems more than happy to end Spider-Geddon with a spider army divided. By the end of the third issue, I’ve got to say that it might take a little more convincing than what we’re given here but I’m more inclined to be on board than I have been yet. That is, indeed, how it goes as Otto and Miles grow further apart over their plans for the murderous Inheritors who are back in full, vampiric force. Otto, the Superior Spider-Man (love the suit, love the catch phrase, really love the dude’s whole deal) sets out to find some compatriots willing to end the Inheritors once and for all. Miles, the ever affable and more kind Spidey taking after the prime Peter Parker, sets out to find some spiders of his own that will put an end to the Inheritor’s plans but perhaps not their lives in the process. It’s a classic, compelling setup that fails to really dig into questions like if the end will justify the means but delivers in a bunch of other fantastic ways. Among those other ways, for example? The multiple lines from Spiders-Man (multiple spiders under the impression that they’re Peter Parker) about finally getting to eat people, repeated references to Supaidaman’s mech and his mech’s super awesome, totally O.P. sword, and Spider-Ben and Petey’s endearing relationship back on the main-stage. There’s plenty here, non-plot wise, to grab onto that really highlights the things that Gage is good at — sincere, unique character-focused writing that revels in a distinctive, personalized voice for each character very well. It’s fun, not weighty, but surprisingly robust plotting that feels more akin to both Spiderverse and the better Edge lead-ins to this story than the previous main issue or subsequent tie-ins have felt to great relief and effect. Especially so, when multiple characters, villains in their own worlds or rights (Otto’s team might not have been vetted the best, after all), start making plays by the end of the issue in what sets up an undeniable and propulsive cliffhanger that feels earned, if a little overwhelming. It’s a shame that the stacked artistic team here, shying away from the mainstay of Jorge Molina who only did the cover art, don’t seem prepared to keep the same pace. Where Molina is exceptionally good at making everything that the Spiderverse is feel unique, dynamic and fluid, things here feel a little static and overly busy. Compare the cover to the interior page and its relatively plain to see. Pages that are more singularly focused seem to fare a lot better than those with a wide array of characters or fight scenes, and the dynamic lighting and expressiveness of everyone adds a good characterization to everything, but in the end there’s just too much going on visually to parse any of it. A bit of a shame for one of the better written and plotted ‘Geddon issues thus far. All said and done, this is an issue of mixed messages. It wants to find a point to make about the means and ends of war, and the plot might find that yet — I certainly love Gage’s character work — but it spends a bit too long lingering on the fun parts to make an lasting salient thing stick while the art can’t keep up with the demands everything the narrative is calling for. A significant step up for Spider-Geddon but not a true return to form either. 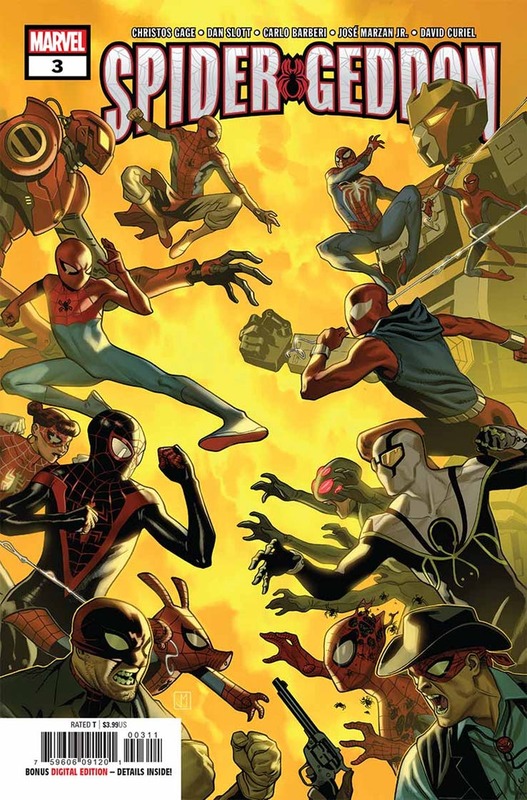 Spider-Geddon's third issue starts settling into a nice -- and incredibly fun -- groove and makes a compelling case for shaking up the Spiderverse finally but it fails to really commit to all of its points, either in narrative or visuals, in a way that feels salient. All of the stuff with Supaidaman kills! The giant mech is rad, the dialogue is sharp and hilarious, I need a solo book yesterday. The humor here is setup in a good sharp contrast to the story's main beats and darker points, when things really get going, the character work is front and center in a good balanced way. There's too much going on visually -- things end up being hard to follow and scenes blend together.